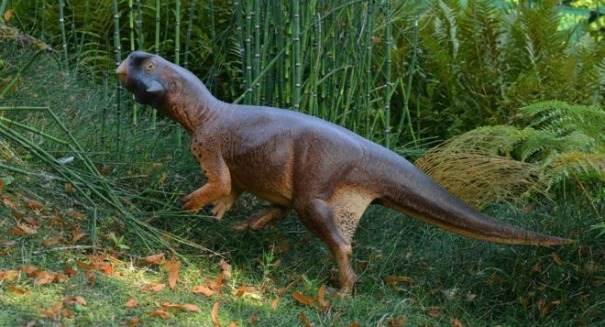 A tiny dinosaur that lived many years ago is revealing some amazing secrets about evolution. Scientists have made a fascinating discovery of a tiny “parrot dinosaur” that lived 100 million years ago called Psittacosaurus, which was the size of a dog and the cousin of the Triceratops. But more than just being an amazing creature, it is also telling scientists a lot of things about the evolution of camouflage. This small dinosaur had a parrot-like beak and was good at blending into the background — ideal for a small animal in a time of great predators. The study, published in the journal Current Biology, used a fossil specimen with preserved skin that allowed researchers to figure out what color patterns were on the animal. They found that the colors on the underside of the dino were lighter than the ones on the back, which is similar to many animals today, like the Great White Shark or penguins, for example. But how would this camouflage be effective on land? Scientists created a model of Psittacosaurus and then went to see how light in different settings would interact with the dinosaur’s body. They found that the camouflage matched the best case scenario for an animal living in the forest compared to a sunny plain. Jurassic park as we speak! They put that animal here they didn’t just kind it.